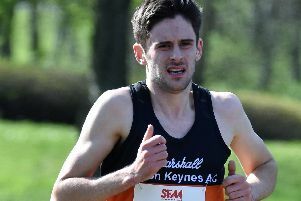 One of the hottest Bank Holiday weekends on record was awaiting the runners of the Milton Keynes Marathon on Monday. First over the line was Denys Olefir from Saint Edmonds Pacers completing the race in 2:37.40 - around six minutes slower than the course record. He was followed home by Scott Harrington (Otley AC) in 2:39.55, with Phil Dickens (Cambridge Harriers) rounding out the podium in 2:43.40. Colleen Nicole Mukuya (Great Yarmouth & District AC) was the first female over the line in 2:57.40, just seven seconds shy of the female MK Marathon record. She was comfortably ahead of Melissah Gibson (Ealing Eagles Running Club) in 3:08.30, with Heather Hann (St Albans Striders) in 3:09.58. The half marathon was won by Michael Aldridge (Wootton Road Runners) in 1:13, narrowly beating David Hudson (Brj Run and Tri) by four seconds. James Bellward (Bedford & County AC) completed the podium in 1:14.07.